2018 Buick Regal GS Test Drive Review: Signs Of Buick's Cadillac-Like Revival? 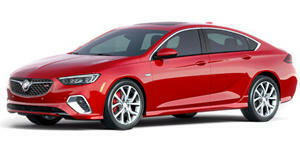 Breaking tradition in Buick's most capable car yet. It was only a few years ago in the post-crash years of the early 2010s that Cadillac made headlines for reinventing itself as a direct competitor to Germany's Big Three luxury automakers. Tired of seeing its cars denounced for being aimed at the retirement home community and feeling like little more than pimped-out Chevy Caprices with pillows in the suspension, Cadillac enlisted the help of stylists and chassis engineers who didn’t sign off on their builds until their cars had made numerous laps around the Nurburgring. Thanks to the current SUV boom, the fruits of that labor have gone largely unappreciated by the majority of customers who don’t care about supercharged CTS-Vs or the fact CT6s can thread their heavy gauge steel through needle-eyed corners. It took a drive in a Sport Red Buick Regal GS to learn that GM’s experience pumping life into what appears to be a dying brand has trickled down to its most snooze-worthy subsidiary. It’s a nice thing to see from a brand that has seemingly spent the last few decades in hibernation, but things weren’t always this way for Buick. Back in the days when ominously loud Grand National GNXs showed up at the drag strip and made Mustang and Corvette owners , Buicks were known for being able to snap as many necks as they did transaxles. Things took a nosedive when Buick's average buyer became a semi-senile retiree that had a strained relationship with their adult children and bought a Buick to leave them without a dime of inheritance money, but the high tide seems to be returning. We could tell by parking the Regal Sportback GS that Buick loaned us outside of our local coffee shop and watching as passersby with gearhead inclinations stopped to take in those pretty lines. It feels strange harboring an affinity towards a Buick’s looks, but the front end of the Regal is hard not to love given that it borrows from the face of the . Directly contrasting that eye-popping red paint is a dark sharply-shaped grille that frames silver wings extending from the Buick logo sitting in the center. Narrow but focused headlights convey a polite confidence and serve as the antithesis to the razor-thin lights many automakers use today to demonstrate that their cars will cut the competition’s throat. Rounding out the GS’ chin is a low front fascia that’s visually extended by twin silver-bordered air intakes. The real beauty in the Regal comes from the fact that it’s more than just a pretty face. Move towards the rear and you’ll encounter 19-inch aluminum wheels with gray accents and red Brembo brake calipers hiding behind. A metallic accent line surrounds the windows for added effect but the real show-stopper is the roofline itself, which pulls off the hatchback/coupe mashup better than much of the German competition. The rear is pleasing on the eyes even though the taillights and the abrupt end of the hatch could use some revision. Pressing the large Buick logo that doubles as a trunk button is all it takes to confirm that yes, good style and ample amounts of cargo space can coexist within a single chassis. It’s tempting to look at the red paint and taunting looks and think the GS is a machine built for road warfare, but glance at the hardware and you’ll see that comfort is the guiding principle here. The lack of paddle shifters might encourage that thought, but don’t think their absence is an indication of how the GS' engine delivers performance. With the 3.6-liter naturally-aspirated V6 resting under the hood making 310 horsepower and 282 lb-ft of torque, this generation’s GS takes the crown for being one of the more powerful production Buicks. It relies on GM’s silky-smooth 9-speed automatic transmission to send power to all four wheels through a clever dual-clutch all-wheel-drive system. The combined efforts of this setup delivers plenty of power off the line. Mash the throttle with sport mode selected and you’ll hit 60 mph from standstill in 5.4 seconds. It’s only when you send the GS ricochetting around the corners of your local twisty road that you’ll run into its limitations. Despite the claims made by the GS’ styling, this is not a sports car that begs for the corners so it can prove it’s worthy of its red paint. You’ll see it whoosh past slow movers in the right lane given its pep and that 9-speed, but the GS reveals itself to be much more of a touring car for the common man when the word “slalom” comes into play. The electrically assisted steering rack proves that by forcing a driver to rely on the chassis and bolstered sports seats to acknowledge that steering inputs have been processed and complied with. A vague on-center feel does little to ease the steering’s disconnect, but the chassis’ reflexive nature and the naturally-aspirated throttle response both help maintain the sense that the Regal GS fits drivers like a telepathic glove. It’s strange, then, that the Regal GS doesn't put up a good fight at the limit. Try to pitch the GS around a bend too quickly and it exhibits a strange pattern of behavior, staying flat while feeling soft and pliable, wanting to push wide and let the tires be the limiting factor. It's likely because the comfort-oriented Continental Pro Contacts that envelop its shiny wheels are limiting, but they seem to fit the Regal's persona perfectly. Using the throttle and all-wheel drive will get the GS around the corner safely, but there’s always a nagging sense that that’s not what this car was built for. The chassis, however, remains a work of art, giving occupants a quiet and plush ride while reserving the ability to be driven hard. And we mean hard as in New York taxi driver hard where strong starts, abrupt stops, and quick lane changes are methods to convey aggression, not time-saving tactics. Despite our disappointment at learning that Brembo brakes don’t necessarily turn a car into a sports car, our smiles grew wider with each day the GS was in our hands. It isn’t all about lap times and lateral Gs, but the Regal GS is a driver’s car that likes to live life purposefully in a way that can resonate with anyone. Yes, comfort-seekers with lead feet may be members of a niche market, but this was never intended to be Buck’s volume seller anyway (anywhere outside of China that is). In both the US and China, technology is key to staying competitive, so it’s of little surprise that the Regal GS comes packed full of it. It’s not just the driver aids and 8-inch navigation screen that do the trick here. Turn the steering wheel after the highly active start/stop system has shut off the V6 and the wheels turn freely without the engine restarting and delivering more juice to the system. The start/stop system itself is one of the best we’ve tested, at times giving off the impression that without the muted sound of a starting engine coming through the firewall, no one would be able to tell that the engine had turned itself off and back on. Spoiled drivers that we are, features like onboard WiFi, Apple CarPlay and Android Auto integration, and the ever-growing list of driver aids like adaptive cruise control, forward collision alert with automatic braking, pedestrian detection, and lane keep assist with departure warning, are expectations. As much as we’d appreciate an transaxle-snapping Buick GS to redeem the GNX, we're appreciative that Buick fit these features into the Regal. Though GS’ interior is offered only in Henry Ford-approved black, silver trim and a modern take on Buick’s roomy old school interiors keeps the cabin comfortable. The only allusions to the GS’ power from the inside come in the form of GS door sill plaques, GS logos on the shift knob, and racing seats with red GS lettering that seem better suited to something with "1LE” badges. As a hatchback/sedan that plans to land blows harder in China than in America, it’s surprising that legroom isn’t omnipresent, but it seems to be the only compromise made on the interior in exchange for those eye-candy proportions. Sandwiched between Chevrolet and Cadillac, the Buick Regal feels exactly as upscale inside as its price point foretells. Leather surfaces coat most touch surfaces but plastic trim that jitters early in the vehicle’s lifespan, a small moonroof relative to the panoramic glass we’re used to nowadays, and buttons (particularly on the steering wheel) that don’t blend into the premium car fabric seen in the rest of the interior can still be found even if they don’t impede on the cohesive driving experience. Two buttons that may be of interest to enthusiast types are come with “Sport” and “GS” labels. Pushing them firms up the suspension and sharpens up gearshifts over Normal mode, but the difference between Sport and GS modes is hard to discern. Like so many cars nowadays, the Regal GS doesn’t come cheap. A base GS costs $39,990 including destination, but our example came in at a stiff $44,110 thanks to a number of options. The $945 Sights and Sounds Package added navigation, a Bose sound system, and HD radio to the 8-inch touchscreen infotainment system while the small moonroof cost $1,000. The Appearance Package adds wireless charging and LED lights that can “look” around corners and level themselves, all for $485, but the most expensive option was the $1,690 Driver Confidence Package #2 that throws all of the driver aids save for the backup camera into a single option. Coming in just under $50k, our Regal GS has a price tag that puts it on the doorstep of luxury car territory. But that’s only one way to look at it. Another way is to say that GM realizes what the Regal GS is actually worth, since a solid argument can actually be made for its price. The fact it was an argument we were more willing to make at the end of our week with the GS was the biggest surprise. We’ll admit it, the Regal GS grew on us, just not for the tire squeal-hungry or historical reasons we expected it to. It doesn’t just look good and feel upscale, it offers a fantastic driving experience that’s comfortable but also capable—as long as you don’t actually try to lean hard on that promise and try to find out how far “capable” goes. Like a luxury car, the GS absorbs harsh city environments well and cruises through urban sprawl like an extension of one's thoughts, but the best thing about the Regal is that this is a car that makes you want to keep driving it. Like a good portion of Cadillac’s lineup, not many people will find out what that feels like firsthand, but that’s okay. Isn’t keeping secrets what niche-filling vehicles are all about?